The makers of CESAR® turns every meal into a special moment. Our delicious recipes give your dog the specific nutrition they need, with variety and love in every bite. Recipes you love made for your dog. With Wet HOME DELIGHTS® wet food, we borrowed the recipes families love the most and made them just for your dog. With irresistible combinations there’s a variety of dishes you are sure to recognize and they are sure to love. Wet your small dog’s appetite! Tender cuts of real meat or poultry simmered in a flavourful sauce will give your small adult dog complete and balanced nutrition with every delicious bite. Try our great lineup of 11 mouth-watering entrées. Or, if you want to stock up, just pick up one of our three 12-pack variety packs so you can surprise your dog with a choice of flavours at every meal! A perfect selection for your small dog. In an effort to satisfy fussy little eaters, the makers of CESAR® are proud to introduce CESAR® Slices Wet Food for small dogs, a delicious and nutritious addition to your adult small dog’s diet. Our five tender, meaty CESAR® Slices in gravy are designed specifically to meet the special needs of your small dog. 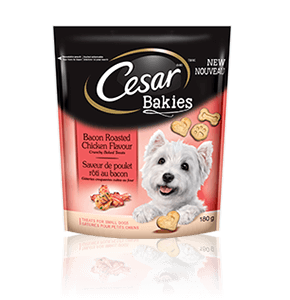 Made with high quality, easily digestible proteins and a high moisture content to promote good health, CESAR® Slices deliver complete and balanced nutrition for adult small dogs, with a delicious taste your fussy dog will love. Stock up on these great tasting meals with CESAR® Slices 12 pack varieties. Tantalize your small dog’s taste buds this morning with the exciting CESAR® SUNRISE® recipes. Love Them Back®. From the very beginning with tasty and specially formulated CESAR® puppy meals. Your puppy’s first 12 months are the most important for their development. 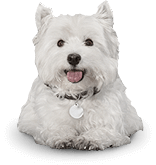 They need a lot of energy and nutritionally rich food to grow into happy and healthy dogs. 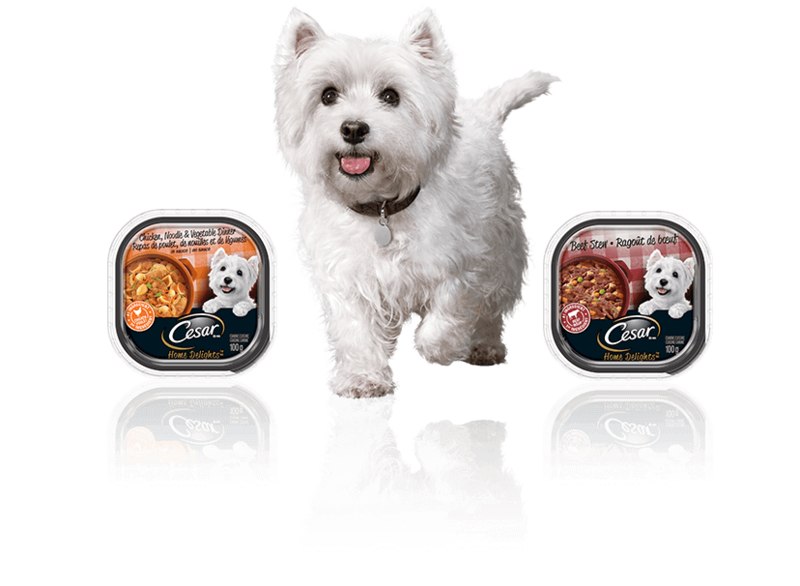 Our CESAR® Dry Food recipes are made with tender, meaty pieces and complemented with flavourful vegetables. With 26 essential nutrients, they are a perfect blend of taste and nutrition. The unique 'H' shaped kibble is designed to be easy for your small dog to pick up and chew, and helps keep teeth and gums clean. With the CESAR® Dry Food, you'll keep your little one happy, healthy and coming back for more. 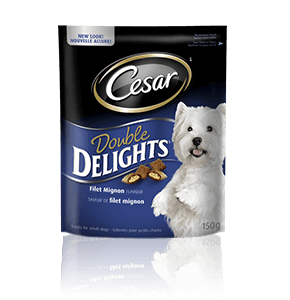 CESAR® DOUBLE DELIGHTS® treats are a perfect bite-sized treat for small dogs. Each treat is nutritionally complete and balanced for adult dogs, free of artificial flavours or colours and is enriched with vitamins and minerals. Best of all, these doubly delicious treats have a tasty outer shell and yummy soft centre that contains less than 3 calories each, so you can feel good about treating your little friend. 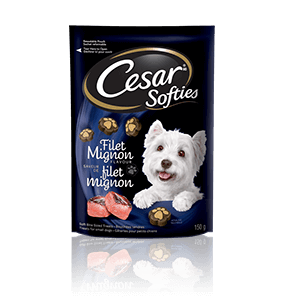 For those special moments when they just melt your heart, reward them with a CESAR SOFTIES™ treat. With an irresistibly soft texture and mouth-watering Grilled Chicken flavour, your small dog is sure to love them. DOUBLE DELIGHTS® treats are a perfect bite-sized treat for your small dog. These delicious flavourful treats have a crunchy outer shell and a soft chewy centre that your small dog will love and you'll love giving. BAKIES™ treats for dogs are delightfully delicious crunchy baked treats. With a tantalizing taste, these whimsical, bite-sized treats are sure to satisfy. 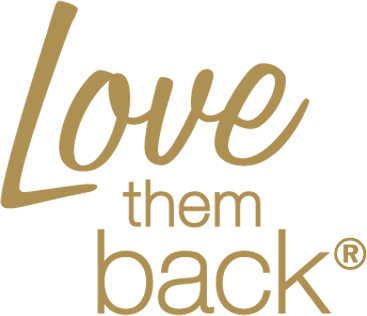 A delicious range of authentic and wholesome meals your dog will love.